People feel the character and energy that’s gone into our interiors and that’s what draws them in. We’ve provided our guests with an opportunity to experience and live the lifestyle. On the way back from a family holiday, inspiration struck to create a boutique retreat holiday pad – with the usual amount of passion & conviction. What cemented this was a copy of Abigail Ahern’s book ‘COLOUR’‘ waiting on the mat and a note inside from her, thanking me for letting her feature my house in her book. 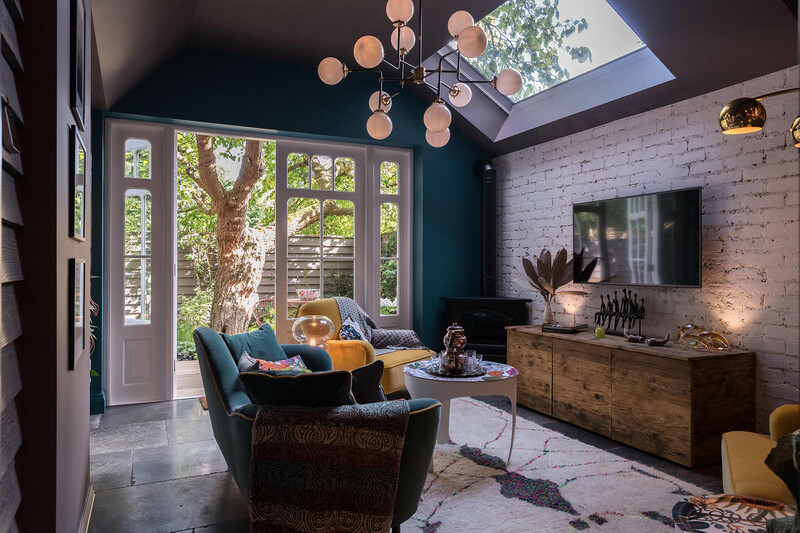 We’d just completed on a 3 bed garden flat in North London’s leafy Muswell Hill right next to Highgate Woods – part of a red brick conversion and it was time to have fun with it! We set about creating this boutique retreat by collaborating with our architects to make essential structural changes. The path was cleared for Mad Cow to collaborate with a specialist to relocate & redesign the kitchen. We added bathrooms you’d want to melt into and created storage solutions without compromising the flow of space. The sunken living room was extended and dug out to create drama out of those awkward Victorian half landings and in keeping with our signature style, every room featured different floor finishes and striking wall treatments. We designed & decorated reclaimed barn wood into bed headboards and had the furniture custom made specifically. On top of all this, we layered curated art & vintage finds selected from various travels and we used photographic prints framed from our own collection of work. The finished result has all the luxury of a boutique hotel but with a characterful homely touch. With its crisp Egyptian Cotton bed linens and towels, its complete range of dinner service, crockery and utilities. For the technically conscious; a Sonos multi room sound system, Cat 6 wiring, Loxone scene lighting, Virgin TV and broadband and even a complimentary in-house control tablet. All you need to move in with, are your clothes! Our guests feel the character and energy poured into this and that’s what draws them in. All we’ve done here is provided an opportunity for them to have that lifestyle, as a temporary experience without them having to commit to it permanently!